A study in last month’s Journal of Alzheimer’s Disease had me googling frenziedly for several hours. Could I really reduce my chances of mild cognitive impairment (MCI) by 50% merely from eating a few more mushrooms? So the prospect of munching on a few mushrooms to sustain my brain was enticing. But is the science robust and is the data reliable? This particular study involved 600 people, over the age of 60, who were monitored for six years, in Singapore. You can read the details here, but the main finding was that those who ate more than 300g of mushrooms a week (effectively two portions) appeared to reduce their odds of MCI by 50%. Even a single small portion of mushrooms (per week) seemed to reduce the chances of MCI. The Professor who led the study singled out a compound called ergothioneine: ‘a unique antioxidant and anti-inflammatory which humans are unable to synthesise on their own.’ And which is found in all types of mushroom. Even the ubiquitous and pallid button mushroom. A 2016 study had already found that elderly people with MCI had much lower levels of ergo than those with no signs of MCI, prompting its authors to suggest that an ergo deficiency may be a risk factor for brain degeneration. And, conversely, that a diet rich in ergo might prevent the brain sliding into decline. Another study – of 13,000 elderly Japanese – showed that those who ate more mushrooms had less incidence of dementia. In 2006 Prof Beelman and a student, Joy Dubost, discovered that mushrooms contained 10 times more ergo than any other food source. The Prof and his team are currently examining the potential of ergo (sourced from mushrooms) to treat neurodegenerative ageing diseases like Parkinson’s, dementia and Alzheimer’s, and multiple sclerosis. The only other way to obtain ergo is by eating foods that have grown in fungi-rich soils (or from animals that have eaten grass from fungi-rich soils). Early research into growing oats suggests that not tilling/ploughing the soil too ruthlessly can protect fungal populations in soils, leading to more ergo in crops. You can read Prof Beelman in his own words here. 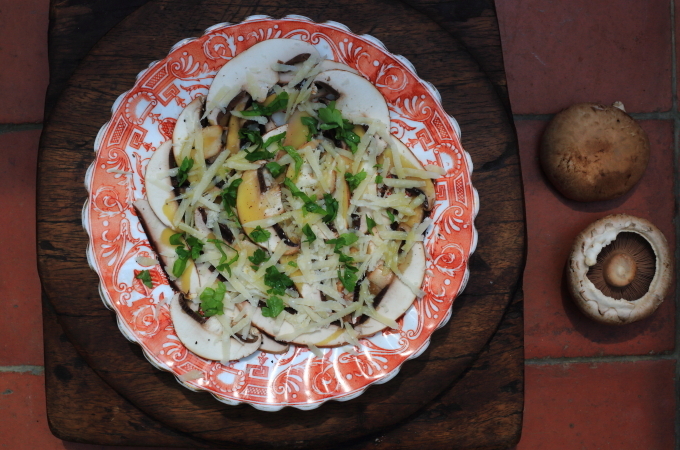 Knowing the potential ergo-power of mushrooms is the perfect excuse to eat more of them. I was served a version of this simple mushroom salad in a little café outside Florence last year, where I was researching my novel, Frieda. The mushrooms were wild and a glorious pale amber colour with flushed gills. I, however, use whatever I can find. Chestnut mushrooms taste more earthy and complex than button mushrooms, but Portobello work too. Slice them as thinly as you can. Thinly slice the mushrooms. Drizzle with plenty of olive oil. Season, using lots of black pepper. Sprinkle on a thin layer of coarsely grated parmesan and top with a little chopped parsley. We are so mushroom-obsessed, our book has an entire section on them. If you’re interested in knowing more, you can pre-order The Age-Well Project here. PS we are delighted to reveal that our book, The Age-Well Project, will be serialised in the Daily Mail, with the first instalment this Monday (15 April). Do grab a copy and let us know what you think of the first extracts. Or look out for the link on our social media. Do you get the same results from cooked mushrooms as from raw ones?